Mads and I popped into the supermarket to grab a few things when these funny shaped apples caught my eye. They were elongated pale green apples with faint yellow-red patches. A little bit like Golden Delicious but more green than yellow. The shape was long kind of a like Red Delicious but without the ribs. Inspection of the fruit sticker identified these as Lemonade – a variety I had not heard of. And so we picked through the bin and chose four pristine specimens to try. 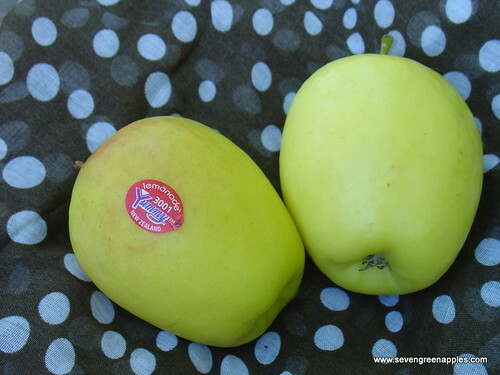 A quick google of the world wide web and Yummy website identified these apples as a new cultivar. But not so new as I thought – they were available this time last year according to the Foodlovers Forum, while The Yummy Fruit Co reckon this is the third season. Anyhow, it was our first taste of the new apple. Yummy Fruit Co Tasting Notes: a refreshing fizzy flavour, slightly tart but very crisp firm flesh. So I was interested to try the apple and see what I thought. We ate them chilled and at room temperature. First thoughts: the chilled apple was a juicy, thirst quenching apple, crisp & crunchy with subtle flavour. Closing my eyes I thought I could imagine I was eating crunchy lemonade without the bubbles. I didn’t really get the fizz, it was more kind flat fizzy like the stuff Grandma kept for when we had bellyaches. The flavour wasn’t lemon, but lemonade doesn’t taste like lemon either. The Anster thought the apple had subtropical flavours – a hint of loquat which tastes like a combination of pineapple and rock melon. 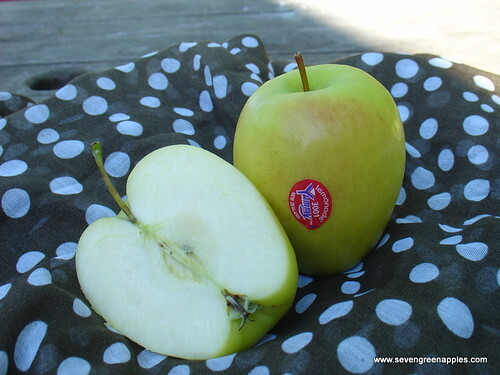 I prefer tart apples – Braeburn being one of my favourite eating apples – so I didn’t find Lemonade overly tart. Eating the same apple (well, another apple but still a lemonade apple) at room temperature yielded different results. The tartness was more apparent and the flavour shone through. So eat the apples chilled if you are after a juicy apple but if you prefer to taste all the subtropical nuances then try it at room temperature or sun-warmed, as if picked off the tree on a sunny day. These apples are an eating apple, but they bake well too. I baked one apple, sliced with a simple sugar syrup and the juice of half a lemon. The apples held their shape and the raw flavour magnified by the cooking. 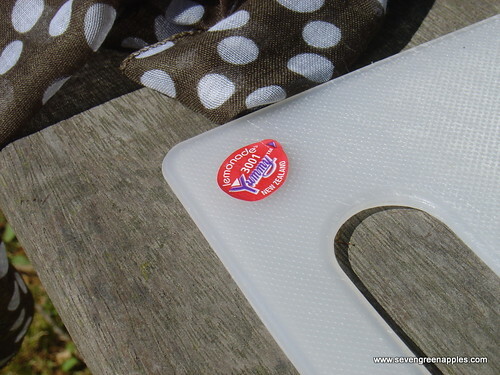 Would I buy them again – yes! In my googling of the apple, I discovered that the New Zealand Lemonade is not the first apple to be named Lemonade. In New Berlin, Wisconsin there is a heirloom apple orchard which grows (amongst others) two varieties only known to this particular orchard: the Old Church apple and the Lemonade apple. Oh to apple my way around the world ……. This entry was posted in Apple Varieties and tagged Apple Tasting Notes, Lemonade Apples by Jo Dohrman. Bookmark the permalink. I tasted the lemonade apple for the first time this year. Delicious never tasted anything like it. 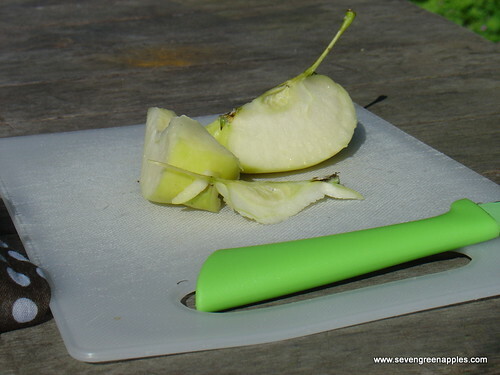 Juicy crunchy sweet but not too sweet like flat fizzy lemonade does anyone know where I can buy a lemonade apple tree? I noticed a Lemonade apple tree for sale in our local garden centre so they are available. I’ll check the tag next time I am in there and see if I can identify the nursery (that’s if they have any left). My daughter posted me two lemonade apples from Wellington. I haven’t seen them in Christchurch. Can we buy them in the South Island? They were delish!! They may be out of season now as I haven’t noticed any at the Supermarket for a while though I have been quite distracted by all the lovely summer fruits available so wasn’t really looking at the apples. I haven’t seen any Lemonade apples up our way this year – so are feasting on Mahana Red apples instead. As far as I know, the Lemonade apple is a NZ variety. I haven’t seen any trees available here in NZ. It is a trademarked apple, so I am not sure if it will be possible to buy a tree. Just bought a couple Lemonade Apples at Central Market in Plano, TX. Very good. They are very refreshing. My latest post compares the Lemonade with Ambrosia – two very different apples but both good in their own right. HI Where I can buy Lemonade apple tree in south Auckland? I’m not sure if they are actually available for purchase yet, I thought I had seen one at our local garden centre but I may have been mistaken. A quick check of a couple of garden centres on-line don’t have them on offer (Waimea Nurseries, Koanga Gardens, Incredible Edibles, Edible Gardens) so I think it’s a safe assumption the variety hasn’t been released for the domestic market yet.